Office Add-ins aren’t the only ones that you can use to extend Excel 2016’s built-in features in some way. You can also use built-in add-ins created by Microsoft or third-party Excel add-ins that you can purchase from a wide variety of vendors. Before you can use any Excel add-in program, the add-in must be installed in the proper folder on your hard drive, and then you must select the add-in in the Add-Ins dialog box. Excel Add-ins: This group of add-ins (also known as automation add-ins) is designed to extend the data analysis capabilities of Excel. These include Analysis ToolPak, Euro Currency Tools, and Solver. COM Add-ins: COM (Component Object Model) add-ins are designed to extend Excel’s capability to deal with and analyze large amounts of data in data models (collections of related database tables). These include Inquire, Microsoft Office PowerPivot for Excel, and Power View. Click the File menu button, click Excel Options or press Alt+FT to open the Excel Options dialog box, and then click the Add-Ins tab. The Add-Ins tab lists all the names, locations, and types of the add-ins to which you have access. (Optional) In the Manage drop-down list box at the bottom, Excel Add-Ins is selected by default. If you want to activate one or more of your COM add-ins, select COM Add-Ins from the Manage drop-down list. If Excel Add-Ins was selected in the Manage drop-down list box, Excel opens the Add-Ins dialog box (similar to the one shown), showing all the names of the built-in add-in programs you can load. If COM Add-Ins was selected, the COM Add-Ins dialog box appears instead. Click the check boxes for each add-in program that you want loaded in the Add-Ins or COM Add-Ins dialog box. Click the OK button to close the Add-Ins or COM Add-Ins dialog box. Activating built-in Excel add-ins in the Add-Ins dialog box. When you first install Excel 2016, the program automatically loads all four add-ins (Analysis ToolPak, Analysis ToolPak – VBA, Euro Currency Tools, and Solver Add-In) displayed in the Add-Ins Available list box. The tools in the two Analysis ToolPaks are added as special functions to the Function Library group and the Euro Currency tools to a Solutions group on the Formulas tab. The Solver add-in appears in the Analysis group on the Data tab. After an add-in program has been installed in the Library folder, its name then appears in the list box of the Add-Ins dialog box. If you ever copy an XLAM add-in program to a folder other than the Library folder in the Office16 folder on your hard drive, its name won’t appear in the Add-Ins Available list box when you open the Add-Ins dialog box. You can, however, activate the add-in by clicking the Browse button in this dialog box and then selecting the add-in file in its folder in the Browse dialog box before you click OK. Analysis ToolPak: Adds extra financial, statistical, and engineering functions to Excel’s pool of built-in functions. Analysis ToolPak – VBA: Enables VBA programmers to publish their own financial, statistical, and engineering functions for Excel. Euro Currency Tools: Enables you to format worksheet values as euro currency and adds a EUROCONVERT function for converting other currencies into euros. 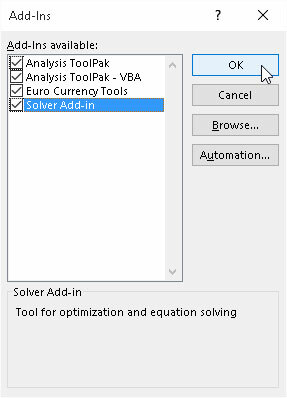 To use these tools, click the Euro Conversion or Euro Formatting buttons that appear on the Ribbon in the Solutions group at the end of the Formulas tab. Solver Add-In: Calculates solutions to what-if scenarios based on cells that both adjust and constrain the range of values. To use the Solver add-in, click the Solver button that appears on the Ribbon in the Analysis group at the end of the Data tab. To use one of the additional statistical or financial functions added as part of the Analysis ToolPak add-in, you don’t access the Add-Ins tab. Instead, click the Function Wizard button on the Formula bar, select either Financial or Statistical from the Select a Category drop-down list, and then locate the function to use in the Select a Function list box below. Inquire: Facilitates the review of workbooks to understand their design, function, inconsistencies, formula errors, and broken links. You can also use Inquire to compare two workbooks to reveal their differences. Microsoft Power Map for Excel: Enables you to map geographic data on an interactive 3D globe. Microsoft Power Pivot for Excel: Enables you to build complex data models using large amounts of data. It also facilitates data queries using DAX (Data Analysis Expressions) functions. Microsoft Power View for Excel: Provides the means for the interactive data exploration and visual presentation of the data in your Excel data models, encouraging ad-hoc (on-the-spot) data queries. Keep in mind that you readily manage your COM add-ins using the COM Add-Ins button in the Add-Ins group on the Developer tab. (To display the Developer tab in Excel 2016, choose File→Options→Customize Ribbon [Alt+FTC] and then select the check box in front of Developer in the Main Tabs list box before you click OK.) When you select the COM Add-Ins button, Excel opens the COM Add-Ins dialog box that shows all of the COM add-ins that are installed and activated. Here, you can activate and deactivate individual add-ins as needed. The add-ins included with Excel are not the only Excel add-ins that you can lay your hands on. Many third-party vendors sell Excel add-ins that you can often purchase online and then immediately download onto your hard drive. To find third-party vendors and get information on their add-ins, open your web browser and search for Excel add-ins. Even before you do a web search, you may want to visit the Add-Ins.com website. This online outfit offers a wide variety of useful Excel add-ins. One example is the Name Splitter that automatically splits full names that have been entered into single cells into individual first name, middle name or initial, and last name cells (so that the list can then be better sorted and filtered by parts of the names). Note that you can expect to pay Add-Ins.com between $25 and $50 for add-in programs such as these (really reasonably priced if you consider how many hours it would take to split up names into separate cells in huge worksheets).